One of the interesting things we can do with the OECD patent database is look at how those patents are distributed among applicants. The applicant for a patent is often the organisation or company that employs the inventors rather than the inventors themselves. By looking at the distribution of patents among applicants we are looking at the size distribution of patent portfolios. Note that an organisation may apply for patents from multiple addresses — in this case I have treated each address as a separate applicant. The plot on the right shows the distribution of European Patent Office patents among applicants from the USA, New Zealand, Australia and Finland. The data is shown on log-log axes — remarkably, the data in all four countries fall roughly on straight lines with slopes close to -2. In other words, the proportion of applicants with p patents is inversely proportional to p squared. This appears to be yet another example of Zipf’s law, which is a frequency distribution that crops up in all sorts of strange places (none stranger than the popularity of opening moves in chess). One way such distributions can arise is through a process called ’preferential attachment’ (sometimes called a rich get richer process). In our case, such a distribution could be generated if an applicant’s probability of getting a new patent increases with the number of patents the applicant already has. 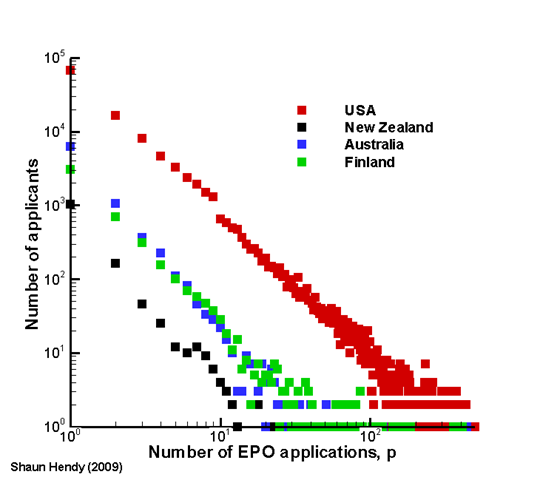 The value of the exponent generated by such a process (close to -2 in the data shown) depends on the rate at which first-time applicants enter the population versus the rate at which new patents arise amongst existing applicants. What is interesting is that the exponents are quite similar across the four countries, suggesting that the process that generates the distribution is the same in each. The main difference between countries is the absolute scale of the distribution rather than the slope. What determines this scale? The best correlate I have found is the level of business expenditure on research and development (BERD) in each country. If we instead plot the number of applicants per million dollars of BERD, the distributions almost collapse on to one another. Actually, you can see that with this rescaling New Zealand comes out quite well — we get more patents for the dollars we spend than the other countries shown. Despite the value for money New Zealand businesses appear to get for their R&D spend, the data show that you largely do get what you pay for. 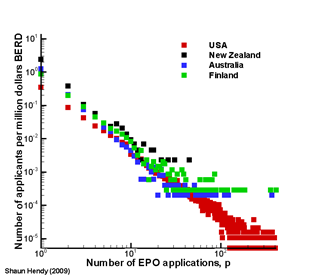 Indeed, the similarity of the exponents between countries also suggest that the innovation process itself does not vary widely — it is the amount of research you do rather than the way you do it that is important. Unfortunately in New Zealand, our focus is all too often on how we innovate, rather than how much we innovate. Ah ha! I knew they’d be there somewhere.